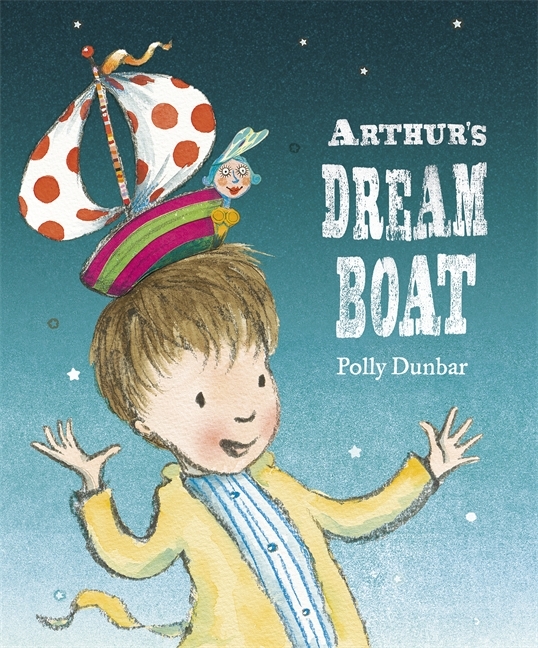 A quick post about a book I meant to write about back in March but that somehow got lost in the shuffle back then: Arthur's Dream Boat, another marvelous product of British author-illustrator Polly Dunbar's imagination. We've been fans ever since she came out with the quietly hilarious Penguin, which has long held a treasured place on the bookshelf of first our older son, and now our younger one (with an occasional revisit from the seven-year-old, even now). This time, though, Dunbar is dealing in dreams, with all their surrealism infused with perfectly sensible internal logic. The title character, a young boy, wakes up one morning and tells his family about a remarkable dream he's just had, about a "pink-and-green boat with a striped mast." He adds detail after detail as he describes the boat to various members of his family, but no one pays much attention, not even to the fact that the very ship he's describing is growing on Arthur's head as he speaks! Finally, Arthur shouts "Listen to me! "—and a huge wave breaks over the whole family, which finds itself suddenly all at sea in the boat with Arthur, sailing off into the setting sun. As is usually the case in Dunbar's work, the text is simple and spare, but the subtext could hardly be thicker or richer. 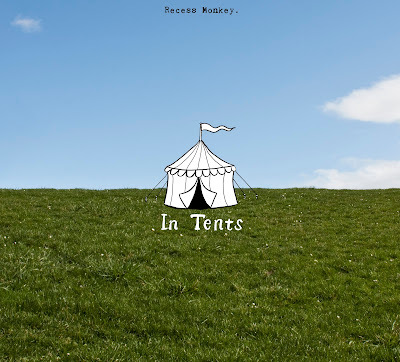 The idea for the book, the author explains in a note, came from a trick of visual perspective: Her view from a beach of a far-off sailboat seemingly perched atop the head of a young boy sitting near her on the shore. Illustrated in pencil and vivid watercolor, and pleasingly reminiscent of, without being imitative of, the best work of Maurice Sendak, Arthur's Dream Boat is an unusual, special picture book. 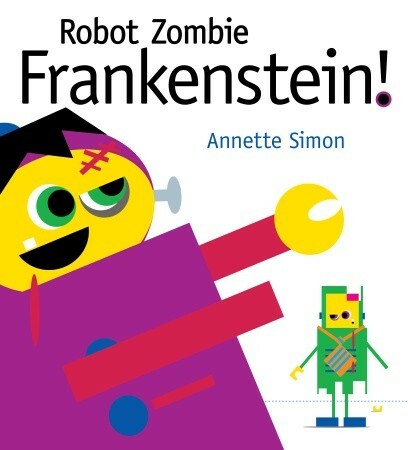 New Books: Robot Zombie Frankenstein! It's finally arrived: the picture book that has everything! This new arrival from author-illustrator Annette Simon not only features not only the three kid favorites mentioned in the title, but also pirates, superheroes...even, yes, pie. Basically, I thought my three-year-old son was going to explode the moment I read him the title. But lest you think Robot Zombie Frankenstein! is merely something your kids will see as you stroll by it at Barnes & Noble and require that you purchase, let me assure you: This is actually a clever little story about two best-friend robots in a friendly game of costume one-upmanship. It effortlessly incorporates a whole series of different colored shapes, to address that whole child-development thing. It even has a truly sweet ending. Which means that what's on its face simply an irresistible book for your kids will also turn out to be kinda irresistible to you, too. 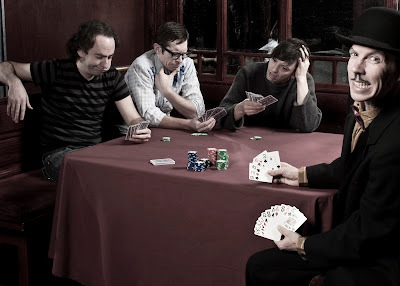 Regular readers of this blog are likely tired of hearing me rave about my family's fave kids' musicians by now, so let me try to encapsulate for newcomers: Recess Monkey is three Seattle schoolteachers, who come out with an album a year (at least! ), all of which are fabulous. Yes, Beatles comparisons in any musical genre are absurd, but that's what you inevitably find yourself coming back to when searching for ways to describe their music. But that's not all the Recess Monkey news. They have upcoming live shows! Those in the NYC area can catch the guys at the 92 Y Tribeca this coming Sunday, April 29, at 11 a.m., as my family will be doing (look for us if you go!). And back in their native Seattle, they'll be previewing the new album at four early May shows at a real live circus setting, Teatro Zinanni. My seven-year-old and I can attest that they put on an irresistible live stage show—so if you're near either city, don't miss them! I'd mostly seen chapter books thus far from the New York Review Children's Collection, those masters of reissuing forgotten classics of children's lit. Not that this was a bad thing, mind you—we've discovered many of our favorite kids' books from the collection, from the infinitely charming "cookbook" Mud Pies and Other Recipes to the irresistible Terrible, Horrible Edie (part of a series I still can't believe isn't better known to modern audiences). But while everything the NYRCC puts out is marvelous, I hadn't seen much in the way of your typical big, square children's picture book from them (perhaps because the classic picture books tend to stay in print in the first place far longer than the chapter books do?). 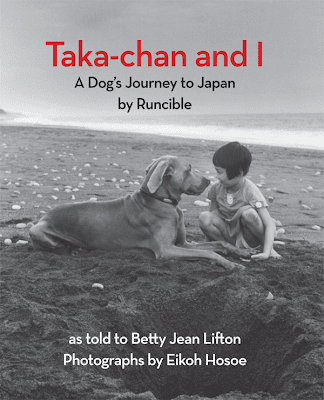 I should have known it was only a matter of time: Taka-chan and I: A Dog's Journey to Japan, by Betty Jean Lifton and illustrated with photographs by Eikoh Hosoe, originally published in 1967, has arrived—and is equally marvelous. The book tells the fable of Runcible, a Weimaraner from Massachusetts who gets especially forceful with his beach digging one day and tunnels through the earth to emerge in Japan. (Or rather, I should say, the fable is told by Runcible in first-person narration.) There he meets a little girl named Taka-chan, who has been taken captive by a sea dragon. When Runcible meets the dragon, it explains that it is angry because the girl's father and other local fishermen no longer pay their respects to him, but that it will let Taka-chan go if Runcible can find the most loyal creature in Japan. He accepts this quest, which leads dog and girl deep into the teeming crowds of Tokyo. Each page is illustrated with a black-and-white photograph by Hosoe, a renowned Japanese artistic photographer and filmmaker who's worked with the likes of Yukio Mishima. While each obviously had to have been carefully staged and directed to fit the narrative, there's an inherent naturalism to Hosoe's images that clicks perfectly with this book's conceit. If Taka-chan and I feels at all dated, it's simply because there aren't many children's books using this kind of framework anymore—and even that effect is only noticeable to parents, I think. Both my sons took to the book, and its typically expressive Weimaraner (photographed some years before Wegman! ), right off, much as they take to any other picture book. In other words, the NYRCC has done it again. May it continue forever! A quick Friday bulletin to parents in the NYC area: The annual Kindiefest music conference is coming up later this month in Brooklyn, the weekend of April 27 to 29. There are lots of speakers and events—check out the details at the website linked just above if you're a musician yourself and interested to know more—but as always, the festivities end with a public concert on Sunday, April 29 (at Brooklyn's Littlefield) featuring some of kindie music's leading lights. This year's roster includes SteveSongs, WeBop, Moona Luna, and Big Bang Boom. Tickets are $12 apiece (infants get in free), and the show starts at 12 noon. (It is, as they say, an all-ages show.) If you're going to be in or near Brooklyn in late April, check it out! Spring is here (we'll ignore the fact that winter never really came to speak of, at least in the Northeast), and as always, with the season come nature-oriented children's books. Two from Candlewick Press stand out, both celebrating the arrival of new creatures and plants, both using simple poetry as their text, and both featuring astonishing and very, very beautiful images. 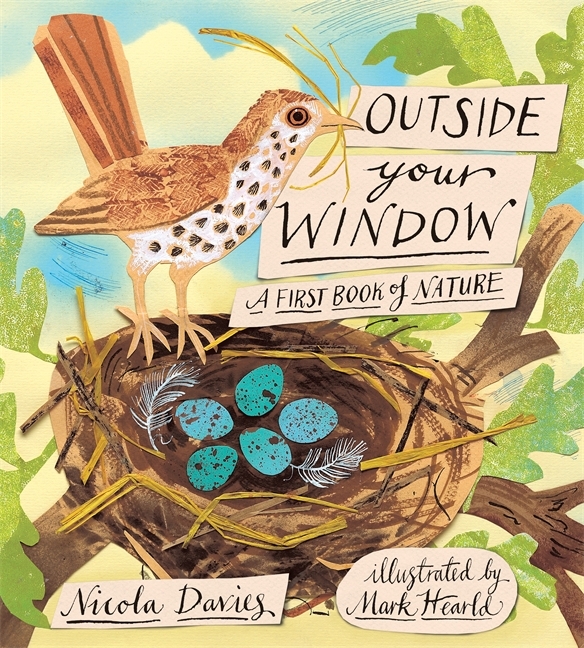 The first, Outside Your Window: A First Book of Nature, is a set of nature poems for toddlers by writer (and biologist) Nicola Davies. 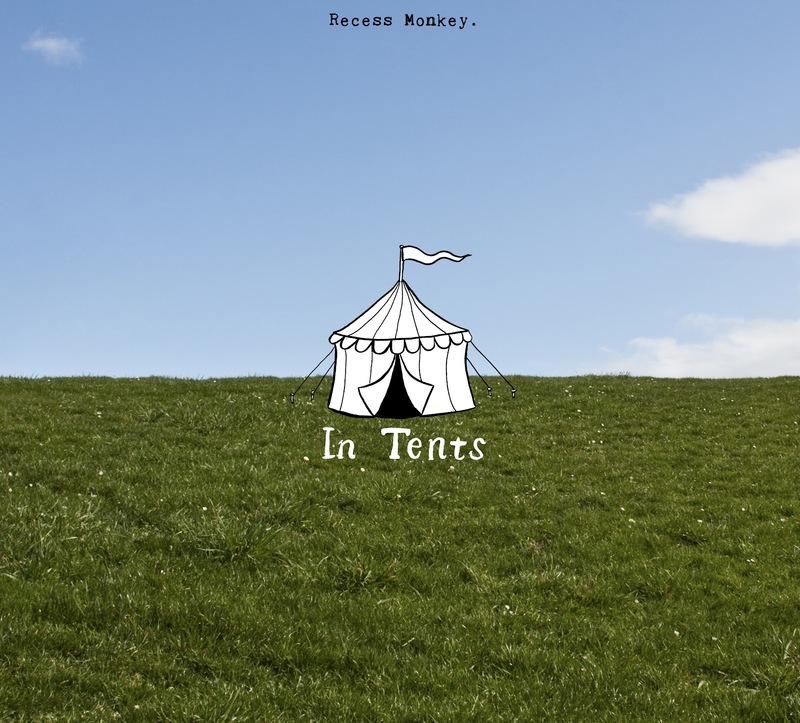 Each page or spread offers a few lines of simple free verse on one aspect of nature a child might encounter (in any season, not just spring)—a feather on the ground, say, or tadpoles in a pond, or a formation of geese in the sky. And each subject is illustrated by Mark Hearld with big, vivid strokes of brush, pen, and collage—a style reminiscent of old Golden Books editions I remember from my childhood. If that's any indication, Hearld's illustrations, and this book, will have a lasting impression on the young kids reading it now. The second, Step Gently Out, has a similar theme of new creatures in springtime, but with two main differences. 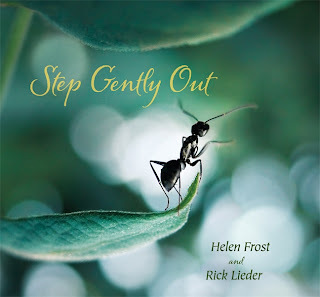 First, its text is one poem by Helen Frost that stretches through the entire book, just a few words on each page or spread. And second, its poetry is illustrated by often mind-blowing photography by Rick Lieder. It's the kind of imagery you usually see in science books for kids these days, or on video in nature documentaries—incredibly detailed and precise close-ups of bees gathering pollen from a flower, or butterflies drinking drops off a leaf. Using these photographs as the illustration for a poetry book, however, was a stroke of brilliance: It removes the clinical scientific aspect that nonfiction biology books for kids often find hard to shake, and replaces it with a reinforcement of the sense of wonder that's always been my first impression of images of this kind. Each book is marvelous and even gasp-inducing at times on is own, but they also complement each other particularly well as a matching pair.